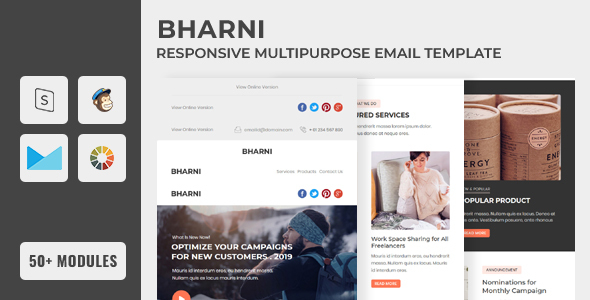 Bharni multipurpose email newsletter templates for most of your campaigns. It has three builder ready and raw html files. PSD file not included. Easy to edit, feature rich better cuztomization make you to create endless no of templates. HTML only file for huge customization. Change the Background Image manually for Outlook (code hack is there. Read the help document) Otherwise it will not work. Google fonts will not work in GMail App, Inbox by Gmail, Outlook and Yahoo. It will take fallback font-face. Images are used for previews and not included.